Choosing and trying out various pipe tobacco flavors is one of the most enjoyable parts of smoking. Maybe you already have a few favorites and are looking for something new, or perhaps you’re just starting to take tobacco choices into your own hands. Regardless, the only way you’ll really know what you like is to try out different pipe tobacco blends. 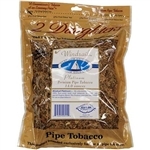 Beyond the tobacco type there are a few other factors that affect the flavor of pipe tobacco. These include the tobacco leaves themselves, the region they where grown and the curing process. This premium pipe tobacco is a superior blend of the finest quality flue-cured and Turkish tobaccos that have been selected, cured, and blended for your enjoyment. A balanced aromatic blend of burley, flue-cured, and oriental tobaccos. Get the best products at the best prices when you buy tobacco online at Indian River Tobacco Traders. There are plenty of small sampler sized pipe tobaccos as well as full sized bags up to 16 ounces. Order $125 or more and your online tobacco purchase ships for FREE.